Here's Edward VIII as you've never seen him before, in his coronation regalia. 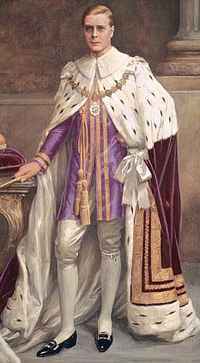 The Illustrated London News had portraits of the king painted in advance for its Coronation Edition. Then came Edward's abdication and his coronation never took place. So The Illustrated London News couldn't publish its Coronation Edition, but the original artwork wasn't discarded. It was buried in the newspaper's archives. During recent cataloguing of the archives in preparation for online access, these illustrations were unearthed. The Establishment considered he was a traitor. I think he was weak. His flirtation with Nazi Germany wasn't too bright either. David Roberts has written a fictional murder mystery featuring The Duke and Duchess of Windsor in his Lord Edward Corinth and Verity Browne series. I can't remember which one. If you're interested, search Fantastic Fiction for the right novel. I work at illustrated london news and would like to thank you for republishing the story about "Edward VIII". Is there any other way I can contact you ? May be by email? I don't give out my email address on my blog, in case spammers find it. You can contact me here with a webpage to go to and I'll follow it up. The email address on my own website is now defunct. I'll sort that out when I get the chance, probably next month.